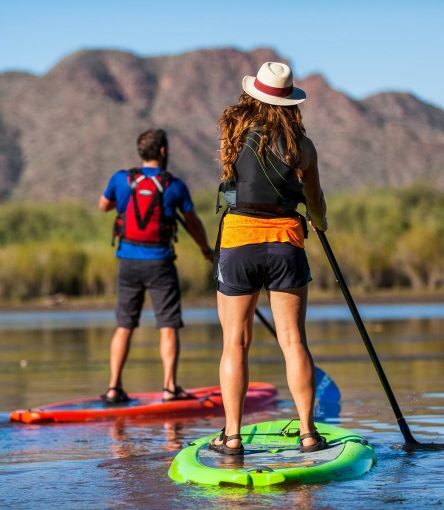 SUP Tours take place on Saguaro Lake and on the Salt River near Phoenix. Our guided paddle board tour features the excitement and ease of paddling a SUP. 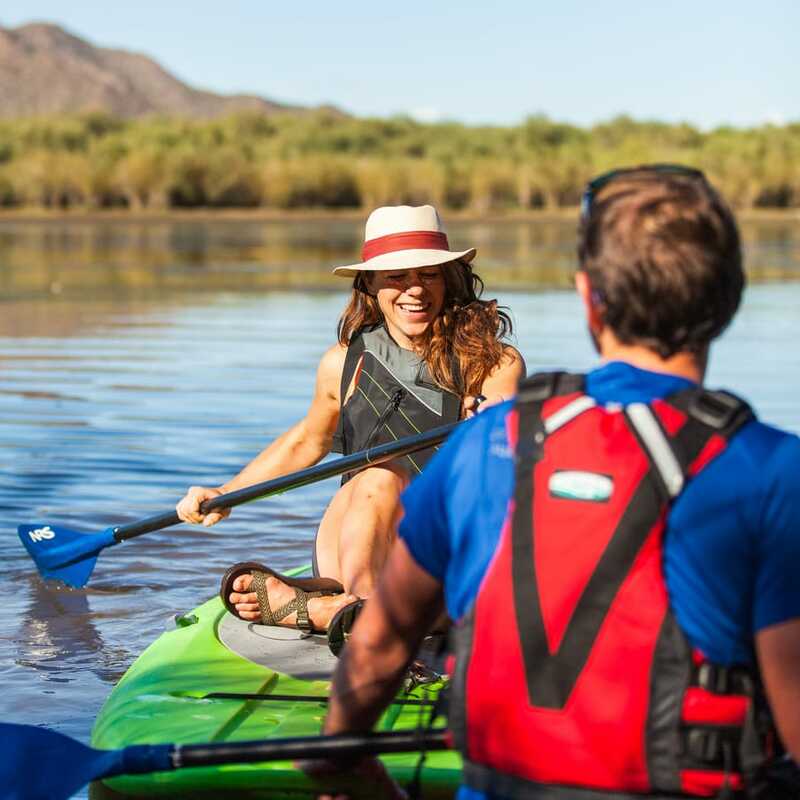 Our tours take place either at Saguaro Lake or the Lower Salt River and explore the beautiful, one of a kind riparian zones of the Sonoran Desert. This is the perfect playground to discover the natural history, flora, and fauna found in this oasis in the desert or to simply learn and practice proper SUP techniques. Paddling a SUP is a great activity for the whole family, allows a full-body workout, and provides the opportunity to witness incredible views of the mountains and wildlife. You will meet at our office in North Scottsdale a few minutes before your scheduled departure time. Once you’ve booked a tour you will receive a booking confirmation email with details on the time and date of your tour, where to meet, the cancellation policy, a receipt of your tour purchase, and requests from us if we need additional information. Inquire over the phone about meeting at our Mesa location. You can expect to be with another group on your stand up paddle board tour unless you have booked a private tour. 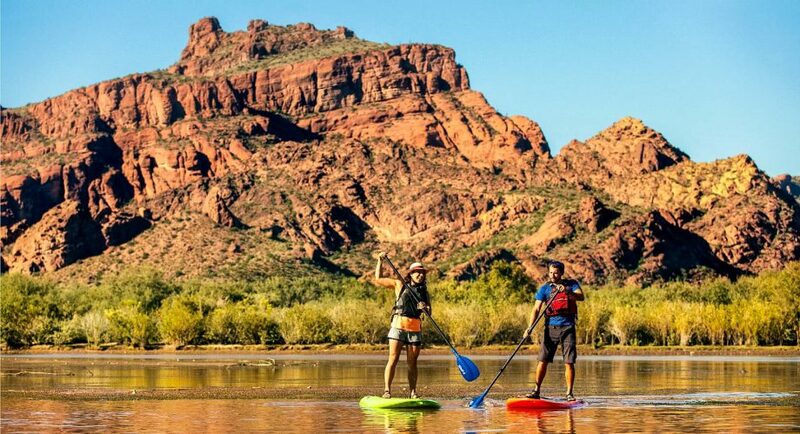 All of our guided SUP tours take place near Phoenix on Saguaro Lake or the Lower Salt River in the Tonto National Forest. The Salt River is a Class I river (the easiest rating on the international scale of river difficulty) and provides some of the best wildlife and bird watching opportunities in the Southwest. Water temperatures are in the 60s in the winter and rise to low 80s in the summer months. Swimming is possible year‐round, but the water may be chilly in January! Tours typically last about 4 hours and are available on Monday, Wednesday, and Saturday mornings and commence at AOA’s office in North Scottsdale. AOA transports all equipment to and from the river and provides water and snacks for the duration of the tour. Our guided SUP tour is a perfect introduction to stand up paddling. 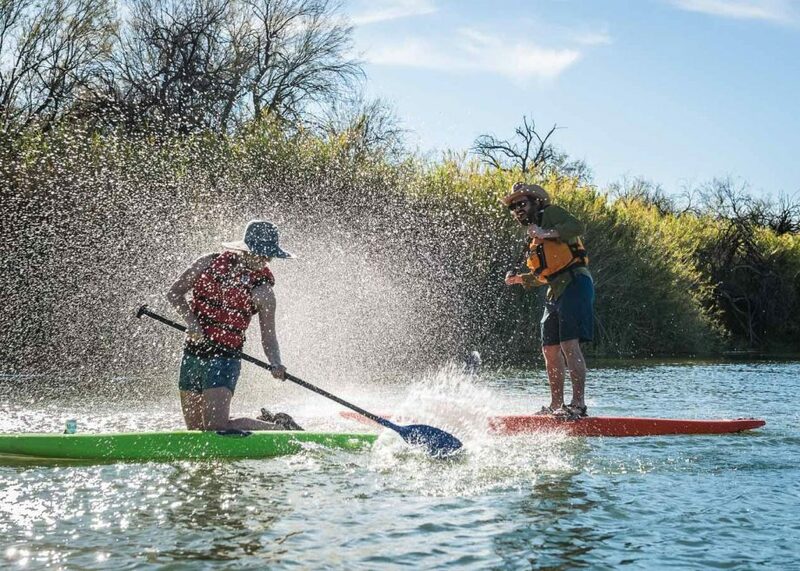 A SUP is similar to a surf board and allows for a standing/paddling form of on-water recreation and touring. On this tour, we learn the basics of launching and landing, techniques for balancing, kneeling and standing, and how to turn and navigate on gentle water. We’ll also have a great opportunity to learn about the amazing ecosystem of a desert river, and see some of flora and fauna which make this such a unique habitat. This tour is appropriate for anyone with good physical fitness, a willingness to learn a new skill, and a modest sense of adventure. Please inquire about advanced tours over the phone, may be subject to an additional fee. 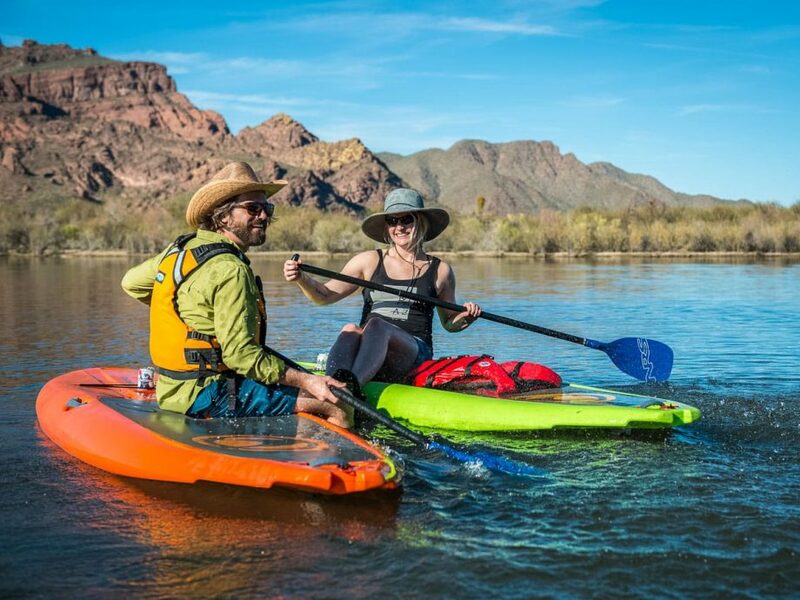 For guests who are already experienced with standing, kneeling, and turning a SUP, this excursion will travel down river, negotiating turns in moderate river currents, and avoiding natural obstacles along the way. Guests should be comfortable moving between standing and kneeling positions on their board upon direction from the guide.